The International Academy of Dispute Resolution – INADR (www.inadr.org), headquartered in Chicago, USA brings FOR THE FIRST TIME in Greece an international mediation competition for students with the participation of many Greek and foreign universities. The competition will be held from May 14-17, 2016, in cooperation with ALBA Business School and the American College of Greece. Students will have the unique opportunity to be acquainted with mediation which is now growing in Greece. The first two days they will meet the more theoretical approach of mediation, with experienced internationally recognized mediators offering their know-how on mediation procedures and techniques. The competition phase will be conducted during the last two days, offering the participants the opportunity to “test” the procedures and their knowledge, and ...get one of the mediation awards! Eligible for the competition are students or group of students (teams of three), either from public or private colleges or universities. 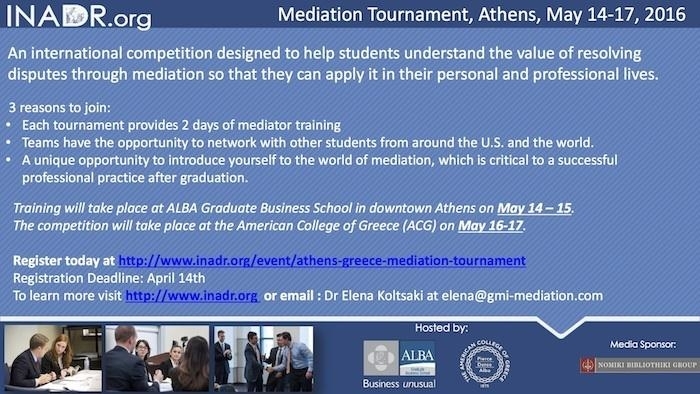 For more information, or for registrations, please send an e-mail at info@inadr.org, with cc to elena@gmi-mediation.com or contact Elena Koltsaki (elenakoltsaki@gmail.com) and the Greek Mediation Institute.